Who doesn't love a Christmas pageant? 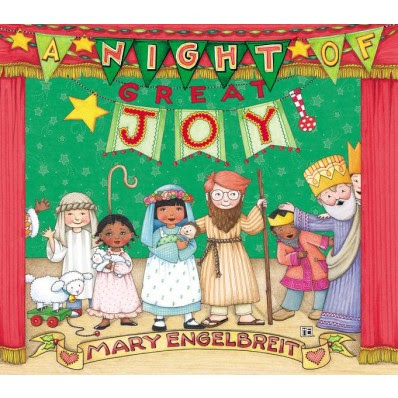 I've long been a fan of Mary Engelbreit's illustrations and of Christmas pageants. A Night of Great Joy embraces the colorful whimsy of her art with the sweet, often amusing joy of a children's play. Mary's simple telling of Jesus birth pairs beautifully with her wonderful illustrations. I love the expressions on the faces of the diverse cast of children as they participate in the most important holiday story. And the shepherds and angels are a hoot. Parents and children will have a lot of fun reading this version of the Christmas story. I see this becoming a classic in years to come. If I could only buy one Christmas book for the children in my life this year, I'd choose this one. I received this book for free from Zonderkidz.